I met with Masconomet coach Bob Romeo to discuss how he gets his team to play at such a furious pace. He shared four shooting drills that are instrumental in getting his team to think up-tempo at practice. Kentucky “Shooting” requires several skills beyond just shooting. The timing of the passes is critical. Coach Romeo emphasized that he wants the players to be in position to shoot on the catch. 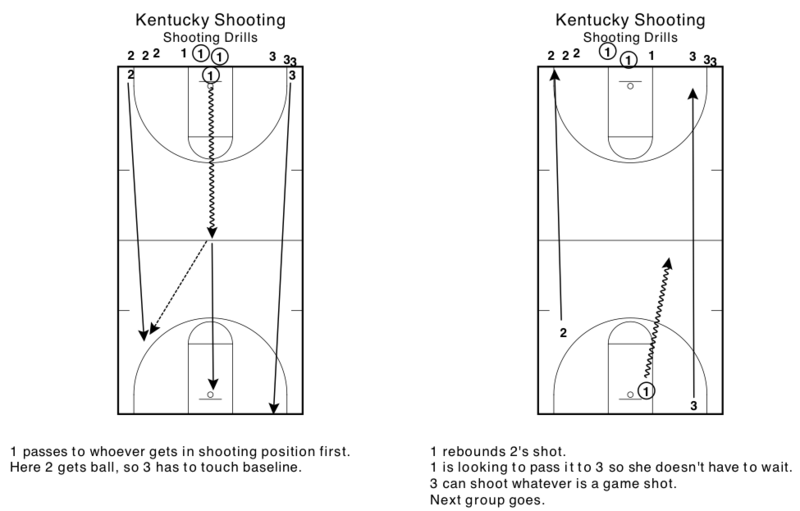 Another value this drill adds is that every player will field every position. Some players do not customarily make decisions in the open court. Now, they gain the skills and become empowered to do it in games. Their ability to speed dribble and have court vision will grow as a result. While the drill looks great, as former Boston College coach Erik Johnson advocates, the drill needs to fit your system. Instead of exclusively working on catch and shoot, I would want to make players get conditioned to utilizing a shot fake and one dribble pull up as well. That also means changing the goal structure. I do not want players to rush their shot fakes. I might score the quality of the shot fakes or penalize bad shot fakes in addition to tracking makes. 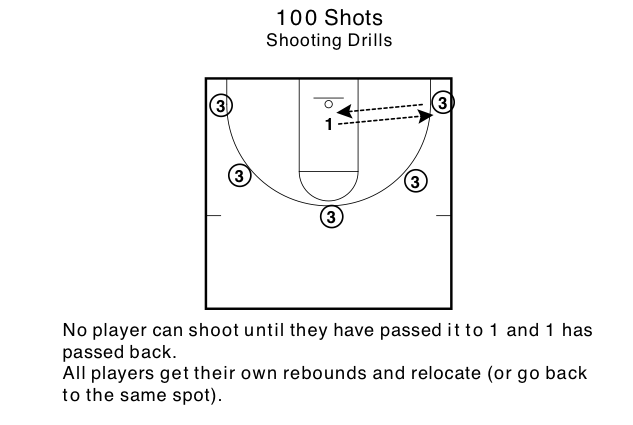 Another drill that is effective to improving up-tempo styles of play is what Coach Romeo calls the 100 Shots drill. The entire drill takes place in the half-court, but what creates a sense or urgency is the competitive component to it and the chaotic nature of it. The competitive component influences players to get shots up quickly. The model of the drill showed only one hoop, but remember there are two groups doing this drill simultaneously. There are teams on both sides of half-court keeping track of their makes and racing one another. After making twenty shots, the passer becomes a shooter. Everyone in the group is a passer at some point. One team eventually needs to make 120 shots (or you could race a clock). 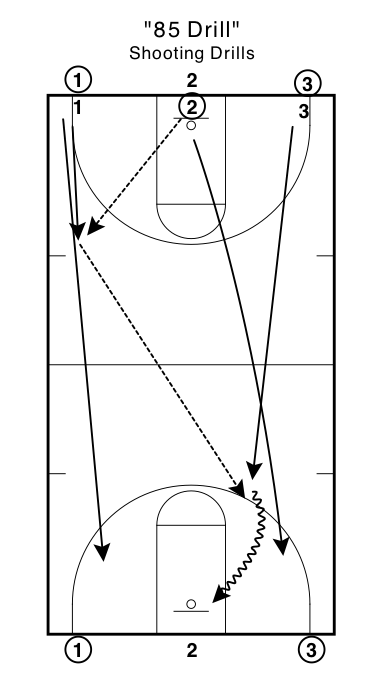 Up-tempo play is chaotic and this drill is also chaotic. There are five basketballs being shot almost simultaneously as the player who is under the basket is trying to make passes. Coach Romeo emphasized that game shots tend to be different than practice shots. Even uncontested shots in games have a chaotic feel to them because of the pressure of the moment. Some people might argue that all these basketballs make the drill unrealistic, but shooting in calmer circumstances is actually unrealistic. In addition to all the benefits of it being up-tempo there are other considerations that make this drill useful. Again, it is multi-faceted. Despite basketballs flying all around, the passer must concentrate on delivering an accurate pass to the shooter. The shooters need to consider the importance of communicating with the passer to ensure that a ball does not get flung at the head of the passer. A second benefit is the coaches are completely left to observe the technique. Coach Romeo said it’s a great time to evaluate footwork and offer feedback where necessary. Another benefit is that only two hoops get used. The amount of hoops available can be an issue at the youth level especially. At the conclusion of this drill, the team will have made roughly 240 shots. I have seen many variations of the 85 Drill and have actually used it myself for many years. We call the drill Rocket Drill to emphasize the up-tempo nature of it. Call it Cabbage Patch Kids if you want. Once again what matters is what you want to get out of the drill. Coach Romeo scores the drill with one’s (lay-ups), two’s (shots), and three’s. When they use three-pointers, he said a great score was 200 in five minutes. I have always scored every basket as only one. A good score with my format is 100 in seven minutes. In hearing Coach Romeo describe his drill I came to a powerful realization. I was giving my players an incentive not to shoot 3’s in this drill. This is a problem. Looking at our stats from last season, more than 26% of our game shots were 3’s. And we were not taking these game shots as often as possible in practice. Needless to say we will be applying Coach Romeo’s scoring format next season. Coach Romeo took the idea from Coach Fortunato, who found this drill online. Here it is in diagram form and here it is as a video from the University of Maryland. When Maryland did it they were able to attempt 18 lay-ups in a minute. Perhaps with a younger team the goal is to attempt 14 in a minute. Regardless, I believe initially an attempts based goal is more valuable. The up-tempo component is the highest priority for the players to meet. After knowing how many the players should attempt, determining a goal for how many lay-ups they make comes next.